Travel in style and comfort through hard to access backcountry, in World class 4WD vehicles to experience some of The World’s most beautiful scenery. The legendary Land Rover Defender is known for its capability, ruggedness and dependability all in one. A perfect vehicle to travel deep into The Mackenzie backcountry with. Step back in time with their character and charm. Capture a photo on our Scenic 4WD Tours with The World’s most iconic off road vehicles that have been around for nearly 70 years. Our vehicles are a large part of what add to the High Country experience we offer on our Scenic 4WD Tours and you will love them too! 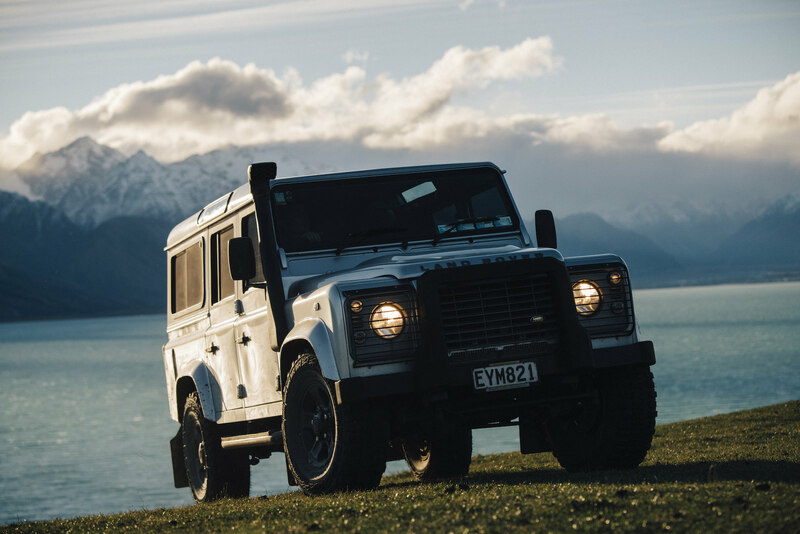 Not only do our Landy’s (as we call them here in New Zealand) offer access to remote backcountry wilderness but they also look awesome while doing the hard yards. Travel in style and comfort through hard to access backcountry with us and in our World Class 4WD vehicles and experience some of The World’s most beautiful scenery. Cross streams and rivers and be marvelled at just how capable these vehicles are off road. Charter one of our Land Rover Defenders with a private driver for an exclusive tour of The Mackenzie High Country. Explore Lake Tekapo’s backcountry in comfort and style.